We are very excited to announce that leading UK fashion retailer, Warehouse, has chosen the Brightcove platform to expand their e-commerce initiatives with video-rich online shopping experiences and a new Brightcove-powered iPhone app. Warehouse, which is owned by Aurora Fashions, has more than 320 stores countrywide and operates the extremely popular fashion portal, Warehouse.co.uk. 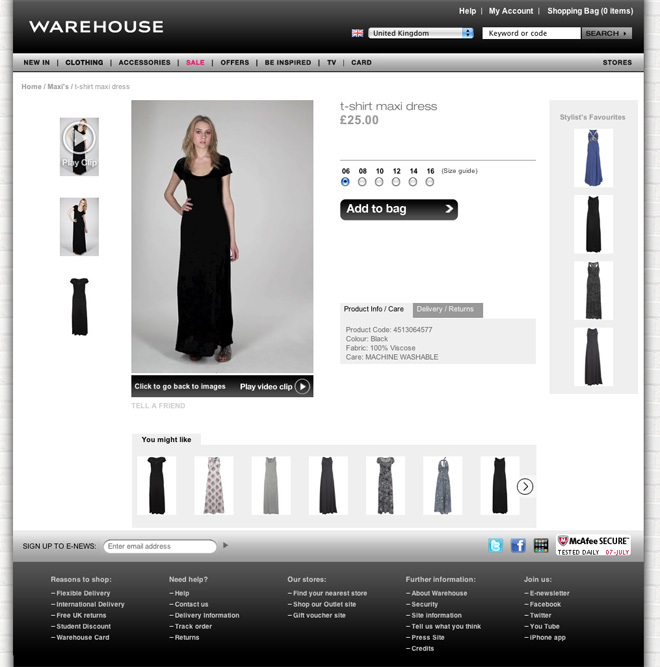 With Brightcove, Warehouse has launched Style Studio TV, which is now available at warehouse.co.uk and through the newly-launched iPhone app. In addition to featuring the latest fashion trends, new arrivals and accessories, Warehouse has also introduced "shoppable" video throughout their online retail catalog. Commenting on the announcement, head of Warehouse marketing, Danielle Brown, explains: "There is no better way to showcase Warehouse's collections coming to life and to tell our story than through video. The Brightcove platform has enabled us to deliver the highest quality user experience possible for our branded video content across both the PC Web and on mobile devices like the iPhone." Warehouse is the latest in a fast-growing list of retailers to take advantage of the Brightcove platform to launch video-rich e-commerce and online video marketing initiatives to generate awareness and drive sales. In fact, last month, Brightcove released a v-commerce whitepaper with Adjust Your Set featuring a case study of Marks & Spencer which showed how adding video to online shopping experiences can produce click-through rates as high as 30 percent and sales uplift by as much as 90 percent. We are thrilled to see the successful multi-screen launch of Warehouse's online video e-commerce initiatives and look forward to continuing our work together. (Read the full press release).